Liz (Janeane Garofalo) is unable to face the world. She hasn’t left her apartment since she watched the planes fly barely past her window on that fateful day. “The weight of the world is love” says street poet Karl (Giancarlo Esposito) who knows the beautiful soul trapped inside her body. He is tireless in his attempts to free her and his methods are both hilarious and poignant. 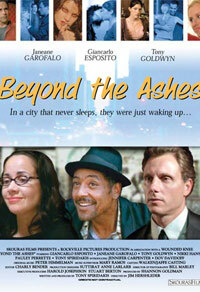 Judy (Nikki Hansen) is hiding from her past and her husband Elliot (Tony Goldwyn), taking refuge in a local bar. She runs into Punch (Tony Spiridakis), a cabdriver with a constant ringing in his ears, ranting the same story to all his fares. Samantha (Jennifer Carpenter), the bartender, harbors secrets of her own. Somehow, through the course of the movie, they manage to impact each other’s lives and hope begins to overcome fear.